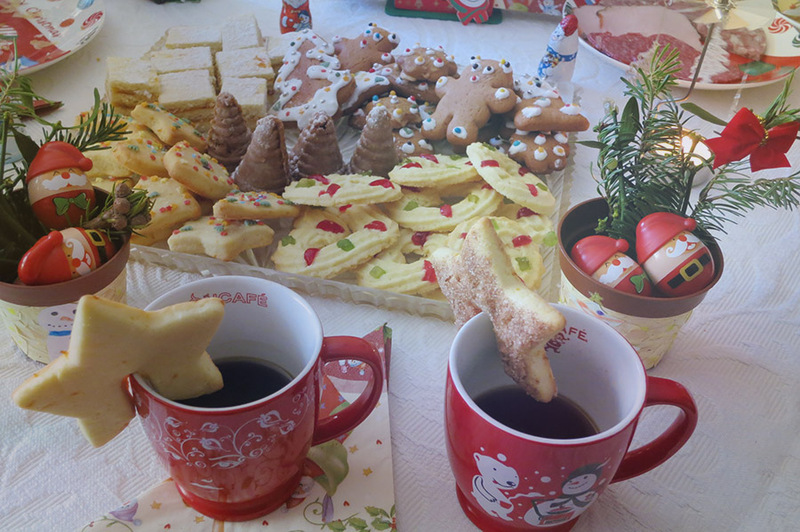 A Christmas tradition that my family and I enjoy celebrating is one of blessing, sweets, and family. Every Christmas Eve, my immediate family gathers and begins the night by following a tradition from my mother’s European heritage. Then, we fill the evening with singing, gifts, and family time. In current years, Christmas Eve has grown even more special to my family, because my two older brothers are away at college most of the year. This tradition is one in which I’d love to see more people participate, and it is something I plan to carry on as an adult. The first part of Christmas Eve is the blessing of the house. This practice symbolizes asking God’s blessing on everything we do, whether it be in the school room or the kitchen. My family has been doing this for as long as I can remember. We walk around my house, saying the Rosary and sprinkling the Holy Water in each room with a sprig of fake spruce. One of my brothers holds an incense burner and leads the way with my father, who is carrying the Holy Water. We have candles lit in each room to help light the way. Each member of the family leads a decade of the Rosary. After we bless the house, we join in the living room and finish the Rosary. Then, I always read the Christmas story from the Gospel Luke. We also put the little baby Jesus figurine into the manger in our Nativity set. This part of the Christmas Eve tradition is one of my favorites and reminds us of the true meaning of Christmas. The next thing we do is go to the kitchen to enjoy sweet treats. My mother and I bake a variety of cookies all week for this special evening. Some favorites in my house include Chocolate Cherry Chunks, Peppermint Candy Canes, Almond Butter Cutouts, Raspberry Oat and Nut Bars, Raspberry Swirls, and Chocolate Crackles. There is always hot chocolate and a few extra treats, such as chocolate bark, chocolate covered nuts or berries, and truffles, depending on what my father buys. We all talk, joke, and fill ourselves with the delicious food. Not only is this a wonderful time to catch-up with everyone’s lives, but it is also a good time to reflect on how thankful we are for each other. After we polish off the food, my family retreats to the living room, where we cluster around the piano. I normally begin this time by playing Christmas songs I have been practicing, and then my mom steps in and plays traditional carols to which we all sing along. We enjoy singing popular Christmas carols, like Silent Night, Joy to the World, Away in a Manger, Winter Wonderland, The First Noel, God Rest Ye Merry, Gentlemen, and Jingle Bells. After finishing the carols, we each have the privilege of opening one or two presents from under the Christmas tree. This time spent together, singing and sharing gifts, fills the room with joy and gratitude. This night is very special to me, and it is one of my favorite celebrations of the year. I hope that, in keeping such a wonderful tradition alive, my family and I will continue to keep a close bond. Not only does it teach us children about the traditions from my mother’s heritage, but it also reminds us about the importance of God and family. I think that, if other families participated in this tradition or at least some aspects, they would enjoy the celebration and find it is a wonderful chance for family time. Christmas Eve at our house, filled with prayers, carols, cookies, and more, is a tradition I will always love! My name is Sonja Hiserman. English is my favorite subject and History is a close runner up. My hobbies include dance (Ballet and Jazz), piano, reading/writing, and watching movies. I’m a bit of a geek and enjoy Star Wars, Narnia, Lord of the Rings, Pirates of the Caribbean and much more. I also love to cook and bake, especially cupcakes. Currently, I have a job doing yard work for a neighbor. I am actively involved with my church’s youth group and I love my Catholic Faith with a passion. Someday I would love to open my own restaurant or become a magazine editor and writer.